Landscape metrics are in widespread use, but previous research has highlighted problems over scale and error in the reliability of the metric values. 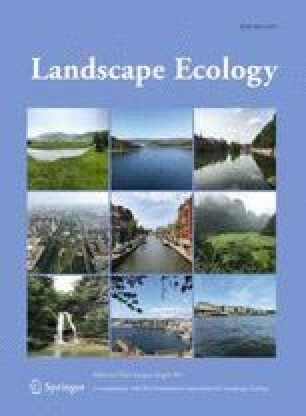 This paper explores the variation of metric values when it is hard to distinguish exactly where one land cover type changes into another; when the ecotone is not an abrupt transition, but has a spatial extent in its own right. The values of metrics are explored in a landscape classified, using satellite imagery and the fuzzy c-means classifier, into fuzzy sets so that every location has a degree of belonging to all classes. The result is that any ecotone can be characterised by a variety of metric values depending on the degree to which a location is in any particular land cover class. The values recorded show some similarities, however, to those for an interpretation of the same landscape with abrupt changes, but the nature of that similarity varies unpredictably between metrics and classes. This analysis provides a limited degree of reassurance for those using metric analysis where the boundaries may have spatial extent, but much further work is required to establish an improved description of metrics under this condition. This revised version was published online in May 2005 with corrections to the Cover Date.